It’s hard to be in the vicinity of Parsons School of Design this summer and not be lured toward its exhibit window. The expression on the person’s face in the second photo is probably similar to the one I had when I crossed the street a couple of weeks ago, catching a glimpse of these striking floating structures from the corner of my eye. 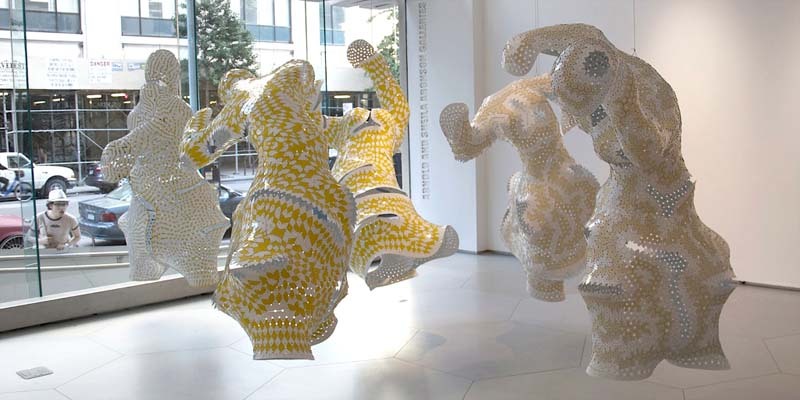 Turns out, these digitally sculpted dancers, titled Les Danseurs du Tailor, are the work of one of this year’s Architectural League Prize winners, Brooklyn-based Marc Fornes & THEVERYMANY. Fornes is a leader in the development of computation applied to design and digital fabrication. He realizes geometrically complex and self-supporting structures for both artistic and commercial purposes, from pop-up stores (such as the Louis Vuitton Pop-up Store in London with Yayoi Kusama- 6th photo from top) to gallery installations and park pavilions. I don’t exactly understand the process, but Fornes digitally designs these skins—which are then produced either in carbon fiber, hand-riveted aluminum, or plastic—by analyzing and evaluating the algorithms and rules encoded in computational systems against the explicit forms, resulting in precise but unpredictable operations. Whatever the process, the results are show-stoppingly stunning. 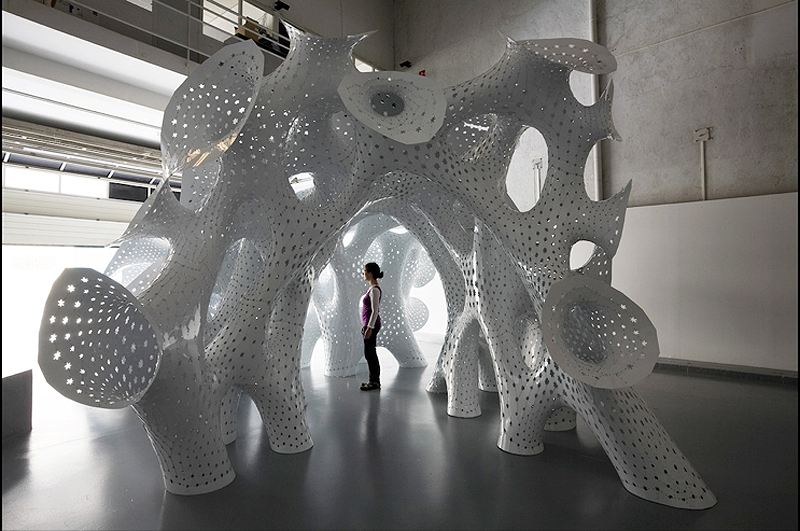 This entry was posted in Architecture, Art, Event, Industrial Design, Just Plain Cool, NYC, Stuff We Like. Bookmark the permalink.